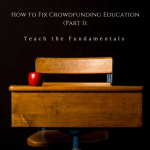 When I was a 16-year-old student sitting at the kitchen table with my head in my hands stumped by a physics problem, my father would sing-song one line of advice: “You have to know the meaning of the words.” Lately I find myself reflecting on his wisdom as I work to demystify crowdfunding for a whole new audience of potential campaign creators, backers and investors – an audience far removed from the shared extelligence of tech and finance hubs. “You have to know the meaning of the words.” This was not just offhand advice. My father spent 30 years of his life as a teacher, and then vice-principal, of a high school. Reading articles from colleagues and mainstream media, I’m left trying to wrap my head around how crowdfunding is defined differently from one article to the next. It isn’t fair to expect the end-user to translate. It is our job as professionals to clarify, to simplify, to streamline, and to agree on the meanings of our words for the benefit of the people we mean to serve. 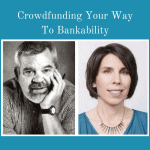 To begin, we need to be more careful in our use of the word “crowdfunding.” Every day rewards crowdfunding campaigns are being referred to as “Kickstarters” effectively obscuring the existence of any other donation or rewards platform. Other online articles suggest that crowdfunding began in 2012 with the passing of the JOBS Act, a statement easily refuted by the thousands of rewards and donation crowdfunding campaigns funded since ArtistShare launched the first platform in 2003. Since the passing of the Title III equity crowdfunding rules in the U.S., many who write and speak about equity crowdfunding have stopped using the “equity” part of the phrase. Among other impacts, I’ve watched conversations on LinkedIn forums about rewards crowdfunding strike terror into the hearts of project creators as someone offhandedly introduces the terms “investor” and the “SEC” into the discussion of their campaigns. “Investor” is a particularly problematic word when it is used interchangeably to describe both the people who back rewards campaigns (often described as “investing in a creator’s ideas”) and investment in equity or debt offerings. Even the word “equity” itself is confusing since many securities are not actually equity, but debt. And “rewards” doesn’t come close to expressing the power of this kind of crowdfunding to galvanize communities around ideas. So I checked out the website of peer-to-peer lender Lending Club to see what language they use to describe their activity. They not only make the case that peer-to-peer lending is distinct from crowdfunding, but that Kiva is “web-based microfinance” not peer-to-peer lending. It’s an interesting assertion given that many peer-to-peer lending platforms including Lending Club are now accepting institutional investors and have distanced the crowd from the borrower. Sounds like “web-based lending” not peer-to-peer or crowdfunding. These competing definitions beg the question: Can we still place all this activity within four neat slices of a crowdfunding pie? Then there is the issue of jargon. As I was reading through my Medium feed, I noticed an equity crowdfunding platform using the acronym “OPO” in a blog post without a reference to what these letters meant. After digging deeper, I determined that the letters were standing in for “Online Public Offering.” So if “online” is what distinguishes equity crowdfunding from an IPO (Initial Public Offering), does that mean online lending and online donation are crowdfunding, too? To add to our alphabet soup, there’s the DPO (Direct Public Offering) U.S. investment crowdfunding that predates the JOBS Act, and the CPO (Community Public Offering) the acronym used to describe intrastate crowdfunding offerings in Oregon. And then, there’s the “crowdfunding IPO” the term being floated about in publications the likes of The Wall Street Journal and Fortune to describe Spotify’s potential Direct Public Offering (DPO). Not all of this alphabet soup is the industry’s fault. Some of this jargon is a function of U.S. government regulation of securities and does not even apply in other countries. But I still assert that as an industry, we’re not helping. For example, four names are commonly used to indicate equity crowdfunding in the U.S. for unaccredited investors under the JOBS Act: Regulation Crowdfunding, Reg CF, Title III and retail crowdfunding. Can we help entrepreneurs and investors out and agree to use one of the four with consistency? Recently my sister passed along an article from the world of public policy addressing the use of acronyms and jargon, and I think it applies to our industry. 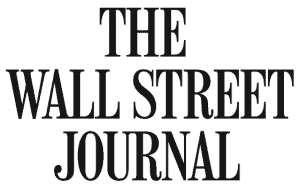 The article emphasizes that jargon “can be alienating or confusing” and “risk(s) obscuring the most important messages: why solutions matter and the people who should care.” The article also demonstrates “how the wrong message can confuse, put off, or even backfire, pitting otherwise friendly stakeholders against one another.” The old financial world of banking that many in the crowdfunding industry rail against is famous for using jargon as a tool to intimidate and exclude. Are we doing the same thing? Day after day I read online posts proclaiming how important it is to educate the potential crowdfunding entrepreneur and investor. If that’s a priority, I don’t see us writing and speaking in an inclusive way. Attend any crowdfunding industry conference and language is wielded like an instrument of power. 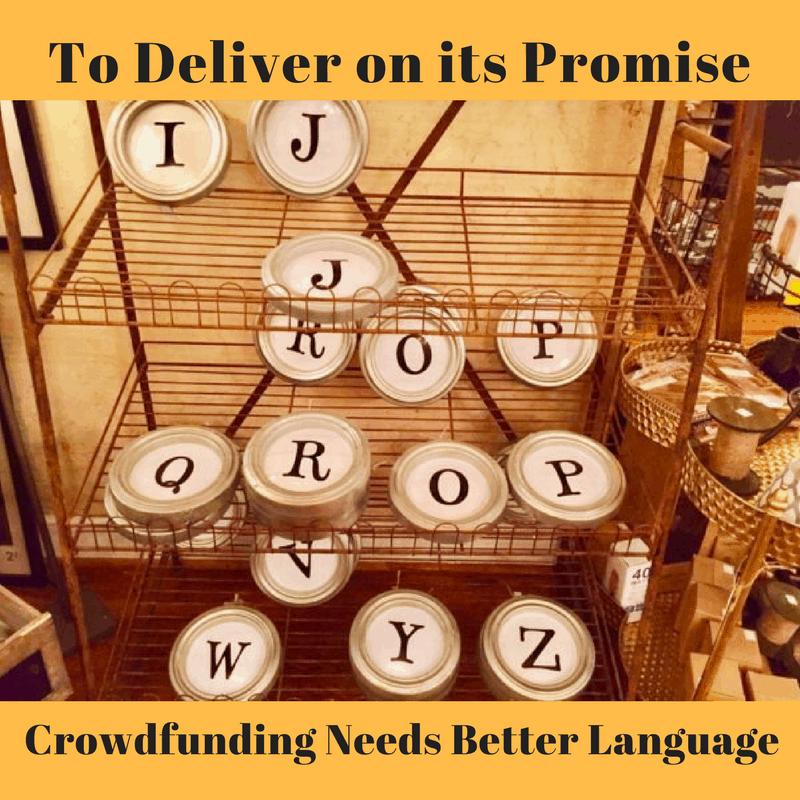 To understand how great the need is for clear language, look no further than the recent study on crowdfunding among minorities and women. One of the key findings of “Building On-Ramps: Results of National Study of Disadvantaged Entrepreneurs” is that many underserved entrepreneurs don’t yet understand what crowdfunding is. While the study indicates that there is much work to be done, the results also suggest the incredible opportunity for professionals in the industry to fix what’s broken in the language right now to make it easier for new participants to come aboard. We need consistency in our language to build trust. Looking around the industry, there is language already in use that we could adopt and use consistently. For example, a recent Forbes article by Devin Thorpe was titled “Investment Crowdfunding: What Works And What Needs Fixing” rather than “equity crowdfunding.” By using the word “investment” or “crowdinvesting” instead of “equity” we can make a clear distinction that participants in this type of crowdfunding are investors, but that not all of these investments result in an equity stake in a business. The problem of the term “rewards crowdfunding” is even more befuddling, especially when data including a study out of Northwestern University indicates that motivations for backing campaigns is not so straight-forward and that some backers even decline any tangible reward at all. One solution to the problem has been suggested by Barry James of The Crowdfunding Center in his upcoming book “New Routes to Funding.” James refers to rewards crowdfunding as “seed crowdfunding” citing that this type of crowdfunding is often (though not always) the first funding for a business or creative project.